In an exclusive interview with Musafir.com, Prathamesh Bendre, unveiled the mystery of travelling with a visual impairment. 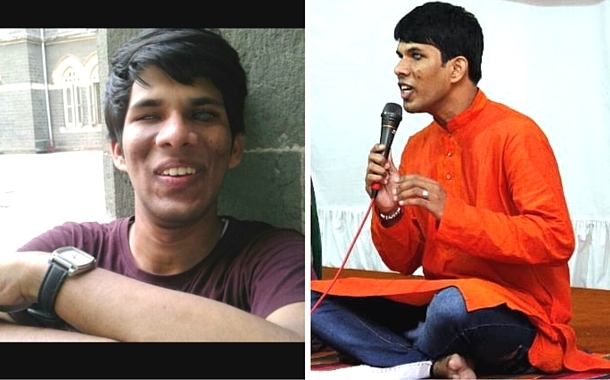 He’s a graduate in Political Science from St.Xavier’s College, Autonomous, and is currently in the second year of LLB from the Government college of Law; he’s a poet, and he’s too good at it. He performs poetry recitals in the corporate space, and other events on special requests. He’s a man without vision, but with an enviable foresight. Leeba : Thank you, rightly put! Now since you know, why don’t you answer it? Prathamesh : The technology today is so efficient that it eliminates so many levels of dependency. When it comes to the ‘how do I see and experience places’ part, I believe I get lucky there. Apart from the poetic way of looking at it, I get to see a place in different perspectives. Each one sees it differently and describes their version of the place to me. I end up seeing that one place in different lights. I also love the early mornings in different cities, they are distinctly different. Leeba : What do you like the most about travelling? Prathamesh : People. I like the fact that I get to interact with strangers. Sighted people wouldn’t interact with strangers as they are in no need for help. But I end up meeting different kinds of people everyday. Leeba: Any travelling experience that you would like to share? Prathamesh: I often reminisce that one day when we’d been for a chess tournament in Hyderabad. It was the last day and our organiser took us to this lake called Hussain Sagar. It was the birthday of the boat owner’s daughter and she wanted to celebrate it with visually impaired people. The party on the cruise lasted for two hours and we had an amazing time. I will always cherish this memory. Leeba : Do you recall any strange question that you have been asked? Prathamesh : Yes! There was this one time when I was travelling back home from college, and a fellow passenger asked me ‘how can you love somebody you haven’t seen?’ Back then I had no answer. But today I do. A mother falls in love with her child that is in her womb, something she hasn’t seen. If that can happen, I can fall in love too. Leeba : What are your travel essentials? Prathamesh : Mobile phone, my braille pad, and hmm... may be something to nibble on. Leeba : Where are you planning to set out next? Prathamesh : I’ve been wanting to go to Kulu & Manali since a long time. Hopefully this year.